On Saturday I attended a wedding reception and I just couldn’t wait to show you all my outfit. I got this dress from AX Paris at the beginning of the month and I’ve been dying to wear it. I’d seen a few girls wear the same dress from the regular line so I was so pleased to see that it’s available in the Curve collection too. I’ve been a big fan of drop back dresses this summer, they’re the perfect way to get your legs out whilst still wearing something sophisticated and glam. This floral dress is available in white and black. Of course, I chose the white as when I take this on holiday it will be the perfect dress to wear to show off my tan. I love the cross over detailing on the bust and the sweet heart neckline, very feminine and flattering. I’d say this dress runs true to size, if a little generous fitting due to the elasticated panel at the back. The chiffon material glides over curves and looks floaty and feminine which is ideal for summer occasions. It is very comfortable to wear, has a great shape to it and looks extremely pretty. 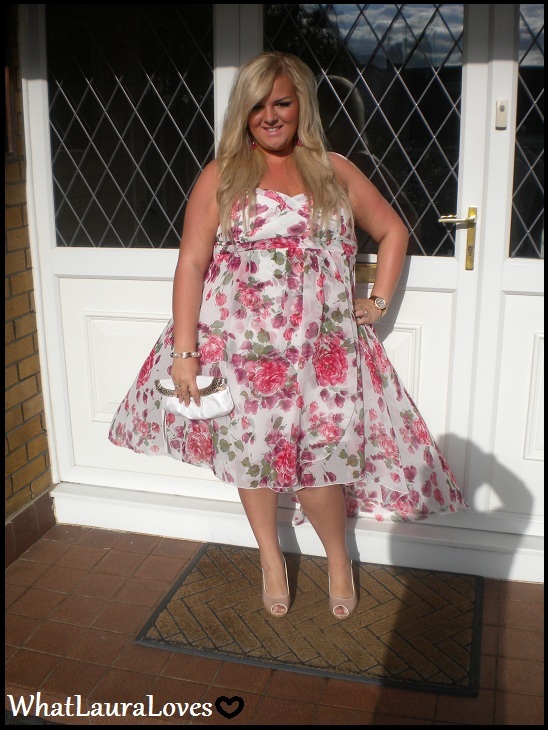 If you’re looking for a dress to wear to a wedding or christening this summer, then this is it. Click here to go to the AX Paris website to check out this dress and their other gorgeous offerings. What is your ultimate wedding outfit? What do you like to wear to summer events? nice !!!!! très belle !